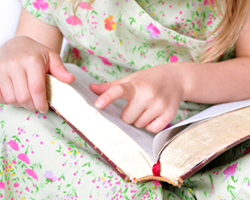 Children’s Church is a weekly church service designed for boys and girls from ages 4-6. It is held downstairs on the lower level during the regular Sunday morning church service. Children have the opportunity to sing, to hear a Bible lesson, and to enjoy some fun, age-appropriate activities. Workers and helpers lovingly care for these little ones and seek to provide a safe, enjoyable atmosphere for them as they learn valuable truths from God’s Word.